What does the convergence of iOS and OS X mean for the Mac? With the announcement of a computer-free iOS experience, application sandboxing, saved application states and a refined launchpad that looks incredibly similar to the home screen of the iPad or iPhone, Apple has made a statement about where OS X is heading. It’s clearly the beginning of a series of changes that will codify the OS X experience as something much more iOS-like than it has ever been. But does that mean that the features coming from the iOS platform to OS X are an attempt to merge the two operating systems? If so, does this mean that Apple will be doing away with the Mac, as some seem to believe? This sharing of frameworks and even design cues between the iOS and OS X platforms has gotten even more obvious with the features revealed in the latest releases of Lion, including the developer preview introduced at WWDC last week. Various innovations that began in OS X have made their way to iOS, like hardware encryption, video chat and file sharing. But just as many seem to be leaking back in the other direction. App sandboxing, automatic state saving, multitouch gestures and a curated store for applications are just a few examples. 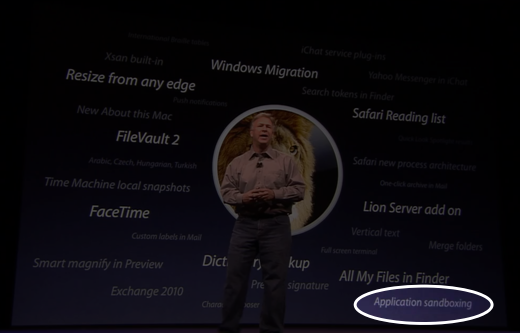 When Phil Schiller, Apple’s SVP Marketing, introduced OS X Lion to developers, he said that there were over 250 new features in Lion, but that he was only going to highlight 10. Almost every one of the 10 features that he went on to detail had taken inspiration or direction from Apple’s work on iOS. It was telling that throughout the presentation about Lion, the word ‘tap’ was used heavily as a substitute for ‘click’. The first time Schiller mentioned tapping, with regard to full-screen apps, you can see him almost say click, hesitate and then substitute tap instead. This was obviously an intentional decision on the part of Apple to emphasize that the future of Mac control was multitouch, not the mouse. Just as you can use iOS devices with a stylus, you’ll most likely be able to use the mouse to control Macs for a long time to come, but Apple is positioning a multitouch trackpad as the primary input method. The experience of making the iPhone and its subsequent success had convinced Apple that multitouch surfaces were the future of computer control, much in the way that Jobs’ visit to Xerox Parc convinced him that the GUI and mouse combination was the future of computer control 30 years ago. The Mac App Store is another major component of Apple’s future plans. As the number one channel for PC software, surpassing even retail giants like Best Buy, the Mac App Store is a huge source of present and future revenue from software. The store goes beyond that though, it paves the way to a future where Apple will be able to exert greater control over the types of apps installed on Macs as well as their quality. There will always be users who want or need to go outside of the Mac App Store to find applications that they use to create content or modify the way that their Mac works. As far as Apple is concerned though, those are going to be the minority. 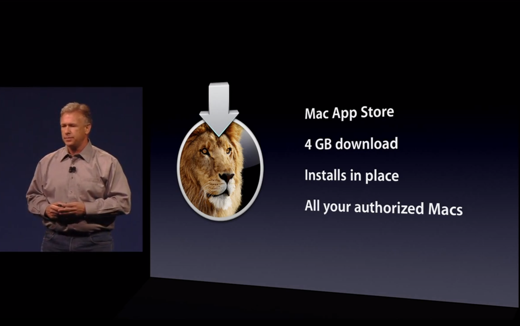 If Apple’s commitment to the Mac App Store was in doubt, the decision to release OS X Lion with the App Store as its one and only method of distribution should settle that argument. If you don’t see the Mac App Store as a clear sign that the Mac will become a curated application platform for consumers then you’re not looking at it the way that Apple does. There will be ways to install software other than the offerings on the App Store, but soon enough many consumers will never have to look elsewhere and they most likely won’t miss it. Regardless of what you think about curation and the still rough App Store approval process, the benefits of tighter control over the applications that are installed on Apple’s platforms are impossible to deny. While the Android Marketplace remains riddled with malware and relatively poorly made apps, the App Store is absolutely thriving with carefully sandboxed applications that pose no real threat to the operation of your device. Consumers don’t know anything about the technical aspects of iOS apps and the way that they’re limited for security reasons, all they know is that they can install any app at any time and not worry about the stability of their apps. The freedom that users feel about installing apps is a component of the success of the App Store that I don’t think gets enough credit. Yes, the apps are good and yes, the platform is attractive to developers because of the high purchase rate, but why are more apps being paid for on iOS? Again, being able to flick through the hundreds of thousands of apps on the App Store and know that, while you may make a bad purchase in terms of quality now and then, nothing that you install is going to affect the day-to-day operation of your device is a huge motivational force. You may find users that don’t purchase apps because they don’t need them or because they may not even know that the App Store offers apps, but you’ll be hard pressed to find anyone that is jumpy about installing an app because they’re concerned that it might crash their phone or damage their data. This surety is nowhere to be found on the desktop (or laptop) PC, where malware and viruses are so rampant that users have been trained to look at any installation request with a suspicious eye. The position that it’s better on the Mac, where viruses and malware are uncommon, is a shortsighted stance at best. I don’t think that the Mac is in danger of being overrun by viruses any time soon, but the possibility is there. The recent brushes with MacDefender as well as other bits of hostile code in the past have driven home the point that the Mac is by no means invincible to malicious hackers. With every Mac sold the platform becomes a more attractive target to hackers. Pretending otherwise is just displaying ignorance. Thankfully OS X is a security beast when compared to Windows and offers users much better protection from common infections than most PC users are afforded. This basic level of immunity, helped by the relatively small installed base of Mac users, has helped the Mac not become a target so far, which is refreshing when compared to the Windows experience. That absolutely cannot last. Apple knows this and that’s why it’s bringing one more feature of iOS to the Mac: Sandboxing. Sandboxing limits the resources available to applications and restricts their access to areas of the operating system, or bits of hardware, that they don’t need to function. This technique is what makes iPhone apps so stable and unlikely to affect the system as a whole. If an iOS app undergoes a horrific crash the most that will happen to a user is that the app will close and they will be dropped back to the home screen of the device. This kind of stability and security is where Apple wants to be with the Mac. To that end they’re going to be moving all Mac App Store apps to sandboxing very soon. Some of the information about this transition is protected under NDA but it’s safe to say that it won’t be optional and it’s going to be soon. Apple wants apps using only the resources that they need unless they have a very good excuse to do otherwise. People that think that Apple is going to go crazy with antivirus or chasing down any bit of malware are missing the bigger picture. Soon, if an app doesn’t play by Apple’s sandboxing rules it won’t install or run on a Mac, period. This will (theoretically) prevent anything questionable from even running on a Mac, much less infecting or crashing the system. This transition is sure to ruffle some feathers in the development community but by and large the developers I spoke to at WWDC about it seemed positive about its effects on system stability. As with installing apps from the Mac App Store, I expect that there will continue to be a way for those interested to install apps that don’t adhere to these rules, for now. The Mac has outgrown the industry every quarter for the last 5 years, PC market shrank 1% year over year while the Mac market grew 28%, there are currently 54 million active Mac users, the Macbook Air is a $3B business for Apple. Many of these numbers were driven home by Schiller in the keynote and while it could have been just been a horn tooting measure, I think that the image that Apple is projecting of the Mac’s success says a lot about what it thinks of the product line’s future. The Mac accounts for an immense amount of yearly profit for Apple and it shows no sign of slowing in growth. It’s just ludicrous to think that the Mac would be ditched in favor of portable devices only. But that doesn’t mean that the lineup will survive in its entirety. If you look at the sales trends you’ll see that the iMac has seen tremendous growth as many people switch from PC to Mac or purchase their first Apple computers. But part of the iMac’s growth has come from within as users realize that they can get away with the performance offered by an iMac and don’t have to spring for a Mac Pro to get the performance gains they once did. 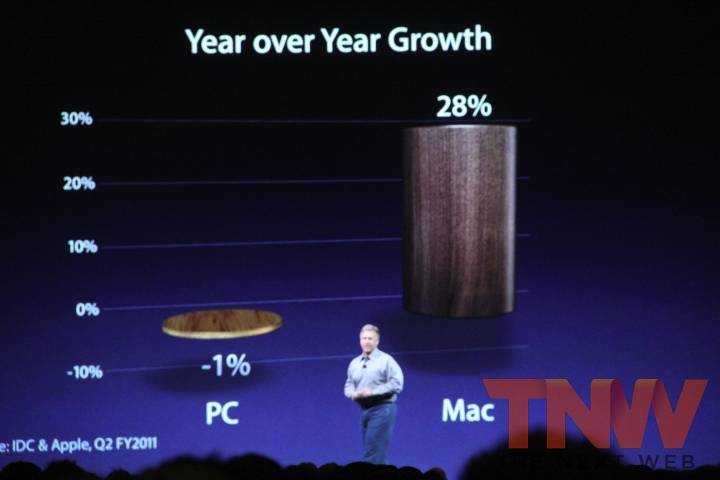 Another product that has also seen massive growth is the MacBook. Specifically, the MacBook Air has seen huge gains over the last year. In addition to beefy profits from the Air, the MacBook brand has been making inroads against desktops and now accounts for 73% of Apple’s computer sales with the remaining 27% wrapped up in desktops. The Mac Pro is offered to creative professionals and remains popular because of its expansion slots, GPU choices and internal storage bays. 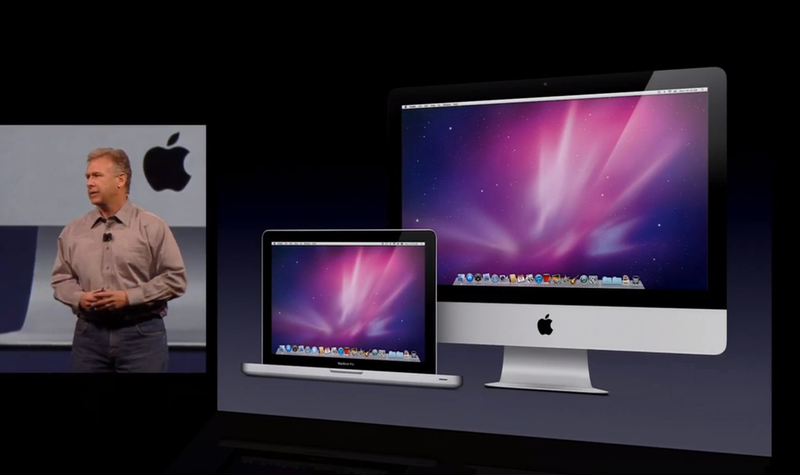 There are also normally a couple of Quad Core options that are a bit beefier than the iMac. They’re also able to pack more RAM. The RAM and processing barriers are mostly artificial, there is very little reason that these improvements couldn’t show up in a future iMac model. As far as external drives and GPU choices, I think that Thunderbolt is Apple’s effort to create ‘build your own Mac Pro’ iMacs that can extend their capabilities through external devices. A powerful, Thunderbolt enabled, external GPU would take care of the need for creatives that need to push more pixels and external Thunderbolt drives have shown some potential to be fast enough to make internal drives an option instead of a necessity for video editing. Customers who would normally have looked at purchasing a Mac Pro could instead buy a powerful ‘core’ iMac system and augment it with fast peripherals. All of this does depend on how well Thunderbolt is adopted of course, and there has been very little promising progress in getting Thunderbolt accessories to the market despite its appearance on iMacs and MacBook Pros. The good thing is that Apple has time on its side. It can afford to continue selling Mac Pros until Thunderbolt or another extensible standard is available to support external devices that you purchase with an iMac according to need. Once the technology matures, the Mac Pro can go away, leaving Apple with a more streamlined lineup. With just a little tweak to replace the low end MacBook with a cheaper MacBook Pro their computing lineup could look like this: iPod touch, iPhone, iPad, MacBook Air, MacBook Pro and iMac. The questions that were raised above are interesting and I think that the truth about them lies somewhere in between the Mac going away and iOS devices remaining completely separate entities. Instead, the Mac and iOS device lineups will eventually be one single lineup of hardware. If you want an Apple computer that fits in your pocket, buy an iPhone, if you want one that works best for shared use away from the desk, pick up an iPad. For home use you’ll have iMacs and MacBooks whose bigger screens and full keyboards offer a friendlier way to create content quickly. It’s easy to see the ways that the Mac and iOS platforms are converging and draw the conclusion that the Mac will somehow be absorbed by iOS and that we will have only one OS to choose from when buying an Apple product. But the dedication that Apple has shown to the Mac and to developing OS X, not to mention the immense growth that we’re still seeing in the platform, paints a different picture. While iOS will no doubt continue to inform the features of OS X and the iPhone, iPad and iPod touch will continue to integrate computing features that we’ve taken for granted on desktops, there is room for both iOS and OS X to keep powering Apple’s computing lineup. Just don’t expect the Mac and iOS device lineup to remain separate forever. In the end, they’re all just Apple computers, some of which happen to fit in your palm. Read next: Europe's Digital Agenda Assembly: A conference fit for a continent's future?